‘Mad Men’ notes: Konnichiwa, New York City! Every Monday I’ll try and check in with the Mad Men episode from the night before and focus in on one or two historical references made on the show. Spoilers aplenty, so read no further if you don’t want to know…. New York’s fascination with Japanese culture has never been because of a particularly large population, especially compared to the city’s other Asian communities. A hearty cluster of Japanese establishments in St. Mark’s in the East Village notwithstanding, there has never been a neighborhood of the size and shape of Chinatown or Koreatown. According to the 2000 census, just over 26,000 people identified as Japanese American, with less than 20,000 foreign-born Japanese residing here. Instead, Japanese influence in the city has been felt through its wealth and through the success of individual businessmen and women. That’s where wrestler Hiroaki ‘Rocky’ Aoki comes in. On last night’s ‘Mad Men’, Don Draper must weather some peculiar cultural differences and the prejudices of his own associates to snag a new account, the Japanese motorcycle maker Honda. 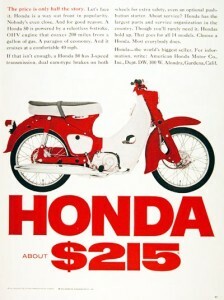 (See the bottom of this post for an authentic 1965 advertisement for a Honda motor scooter.) In that frame of mind, he takes his date to one particular new midtown restaurant, Benihana, where Japanese food is prepared on grills in front of the patrons by daredevil chefs. A lively and noisy atmosphere, hardly romantic, his date notes. Benihana was the brainchild of Aoki (at right), a wrestler who qualified for Japan’s 1960 Olympic wrestling team (he didn’t compete) and came to America in his early 20s touring the wrestling circuit. He expressed a decidedly entrepreneurial streak, moving to New York in 1963 and he paying his way through business school by, among other jobs, operating a Mister Softee ice cream truck in Harlem. His curious idea for an eatery — which brought the chef and steel grill into the dining room, preparing steaks and seafood for dizzied diners — was named after his parent’s own restaurant in Tokyo (Benihana, meaning red safflower). He bought out the lease of an unsuccessful Chinese restaurant at 61 West 56th Street* and opened Benihana Of Tokyo on May 1964. The first restaurant was a tiny affair, much too small — four tables — for the theatricality he envisioned. And New Yorkers were at first confused, even intimidated. Of the few New York Japanese dining spots that existed, they were mainly for Japanese people; the embrace of sushi culture was many years in the future. Here, however, was a bold, dramatic and certainly exotic display of Japanese pomp, serving dishes that seemed somewhat ordinary. It might had faded like so many midtown culinary novelties if not for the New York Herald-Tribune popular food writer Clementine Paddleford who, late in her career, threw Aoki a rave review. Within months, those four tables were hardly enough to meet demand, and Aoki opened a second location a few blocks east. 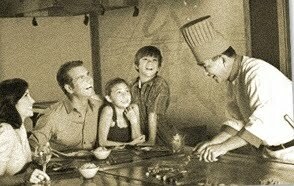 Benihana, of course, would be a concept suited for expansion, hitting Chicago and San Francisco before the end of the decade and soon swelling to dozens of locations all over the United States. 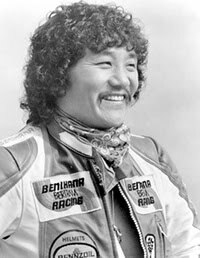 Aoki, who died in 2008, was quite an extravagant character, a Lothario (throughout his life, he famously had numerous wives, mistresses and girlfriends) and an avid adventurer, racing speedboats and reportedly even flying a hot air balloon over the Pacific Ocean in the early 1980s. He and Don Draper would have gotten along famously. *The restaurant moved down the street to its present location at 47 W. 56th Street in 1973. For more on New York’s curious history with the Japanese, you might like to check out the brand new exhibit at the Museum of the City of New York called Samurai In New York: The First Japanese Delegation, 1860, taking a look at an entourage of 70 samurai who held court in the city 150 years ago.